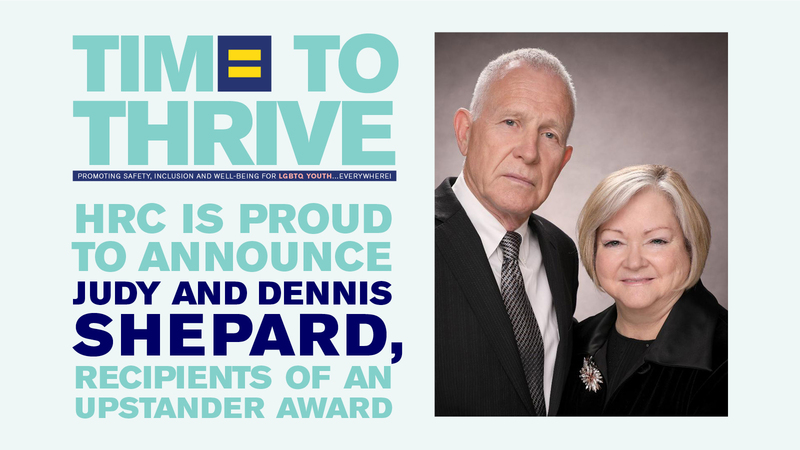 Today, the HRC Foundation announced that it will honor longtime allies and LGBTQ advocates Judy and Dennis Shepard with the Upstander Award at the organization’s sixth annual Time to THRIVE Conference on February 15-17 at the Anaheim Marriott in Anaheim, California. The couple’s work through the Matthew Shepard Foundation continues to inspire, bringing hope and support to LGBTQ people around the world who are striving to be who they are, often in the most difficult of circumstances. Judy Shepard has served on the HRC Foundation Board of Directors since 2001. In the aftermath of Matthew Shepard’s murder in Laramie, Wyoming, Judy and Dennis Shepard also joined with the family of James Byrd Jr., brutally murdered by white supremacists just months before Matthew’s death, to help pass the Matthew Shepard and James Byrd Jr. Hate Crimes Prevention Act (HCPA) in 2009. They continue to advocate for comprehensive efforts to prevent and prosecute hate crimes. Since its formation, the HRC Foundation has centered its efforts on providing a voice and support for LGBTQ youth, combating hate crimes, and creating community dialogues around hate and acceptance. HRC’s Time to THRIVE Conference is the premier event addressing the safety, inclusion and well-being of LGBTQ and questioning youth. The event brings together a wide range of youth-serving professionals to discuss best practices for working with and caring for LGBTQ youth and their families in schools, community centers, health care settings and beyond. It is co-presented by the National Education Association and the American Counseling Association. BBVA Compass and AT&T are presenting sponsors of the event. The Time to THRIVE Conference features 65 workshops by more than 45 national and grassroots organizations dedicated to improving the lives of LGBTQ youth. HRC’s Youth Ambassadors and Welcoming Schools will also be featured at the conference. Additional speakers and honorees will be announced at a later date. To register, visit www.TimeToTHRIVE.org. Early bird registration expires Tuesday, December 11.